I am not very good with the DIY stuff... I have been trying really hard to do a few of my own little projects for Andie. I wanted to have something with her name on it for a shelf in her room, so after looking around for some inspiration on pinterest... I figured out a way to make one. I am not sure if any of you have tried to free-hand paint chevron stripes... but I knew my hand was not going to be steady enough to do that. So I figured I would just make a stencil to paint with. I did 1.5 inch by 1 inch - it was just a shot in the dark. It's not perfect... but it worked pretty well! That looks FABULOUS!!! Well done....I am terrible at DIY or anything remotely creative, so I think you are a genius for doing this!!! I love this so much! It's a perfect DIY and you did a gorgeous job with it :) Thanks for showing how to do it - I love all things chevron (and am also not a great DIYer). it looks great! nice work! i love the paint colors! So it's so cute! 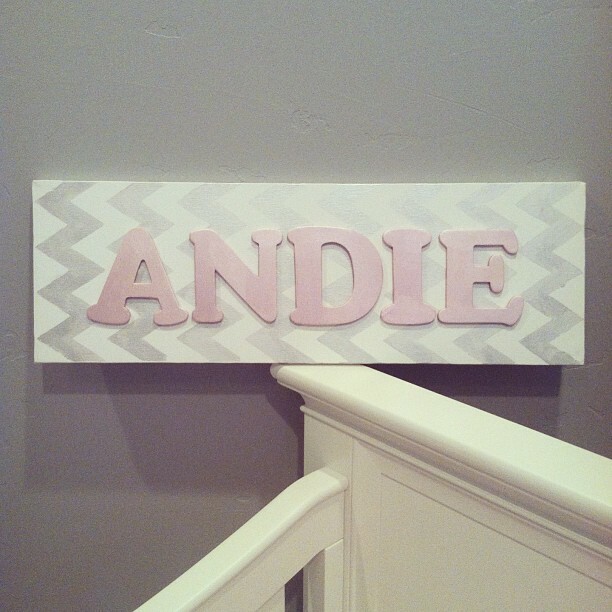 I love the chevron, that's what I hope to have in our nursery. I am SO impressed - it looks professional! Nice job! looks pretty darn cute to me! well done! Look at you going all Martha on us! It is so cute Tracy! Very cute! You're so crafty!!! so cute! way more crafty than I got for Elyse's room...I left all the DIY to my mom! soooo stinkin' cute! it turned out great! Aww, I love it! So cute. That turned out really cute! !